Cleverness, the saying goes, will only get you so far. 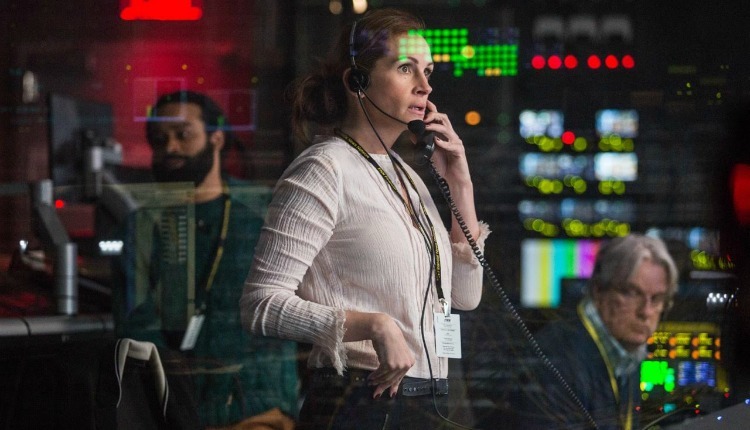 Money Monster is a clever movie, and gets fair distance from that — and then some, thanks to a stronger cast than it deserves — but the premise is only strong enough to support about two-thirds of a narrative. For the first hour of Money Monster, it works just well enough. And then it doesn’t quite. 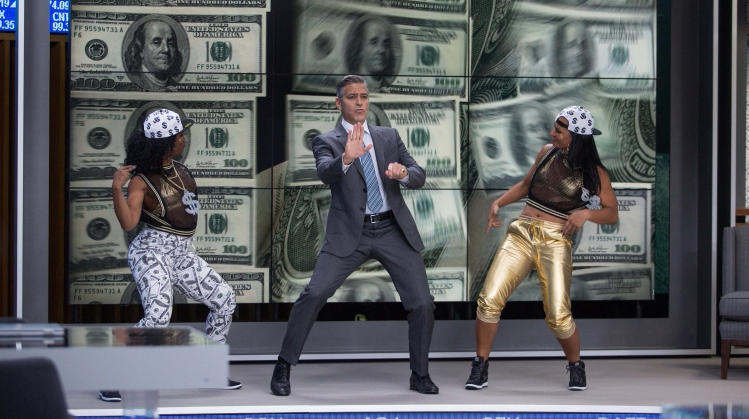 George Clooney plays Lee Gates, a (very) thinly disguised version of Jim Cramer, host of a financial TV show called Money Monster. After weeks of insistently telling his viewers to invest in IBIS Clear Capital, the company has just announced a “glitch” in their algorithm, which resulted in $800 million vanishing without explanation. The real-time events that follow unfold as Gates, guided by his overcapable and underappreciated producer, Maggie (Julia Roberts), is taken hostage at the top of his show by a man who lost everything thanks to the glitch and Lee’s investment tip. Kyle (Jack O’Connell) has come to the set with a gun and two explosive vests, intent on not leaving until he exposes the corruption and immorality of Lee and all the Wall Street fat cats Lee supports with his show. Effective thrillers have been made with less, and indeed, Money Monster works really well for a long stretch. The screenplay by Alan Di Fiore, Jim Kouf, and Jamie Linden lends itself to a film only about an hour and a half long, which makes for a thriller that aims to be sleek and compact, exactly what it should be. The big issue is that Money Monster wants to diversify its own stock too much. It wants to be an expose of the greedy “one per cent” and a hostage thriller and a moral statement on placing more value on the almighty dollar than on human decency. It’s a fine enough jack-of-all-trades – but it’s a master of none of them. Money Monster is an adequate exposé of Wall Street, but compared to more knowledgeable ones like Margin Call or The Big Short, it just doesn’t go far enough. It’s an adequate hostage thriller, but compared to more tense ones like The Negotiator or Captain Phillips, it just doesn’t go far enough. It’s an adequate moral indictment of mass media, but compared to more scathing ones like Network or The Truman Show, it… you guessed it. Jodie Foster, in her fourth turn behind the camera, remains plagued by a symptom common amongst actors-turned-directors: she knows what she needs to do, but doesn’t always have the nuance to go about it the right way. Some scenes are handled capably, but others have the precision of a chainsaw — and about the subtlety of one, too. 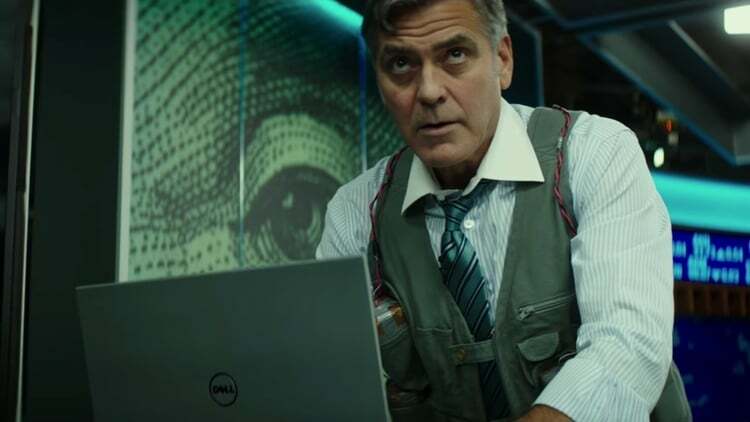 A lot of the Money Monster succeeds due to Clooney and Roberts, whose natural performances are stronger than their one-dimensional characters really warrant. There’s an effortlessness to their performances that is made all the stronger by their wonderful dynamic, honed years ago in the Ocean’s Eleven movies. 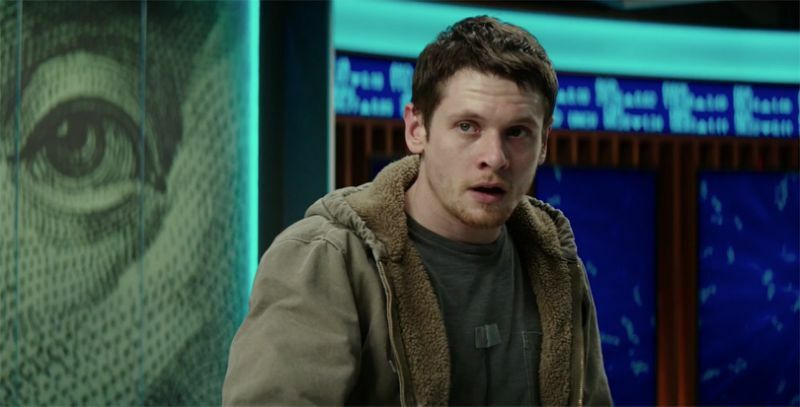 O’Connell, on the other hand, is just plain miscast as Kyle. Talented as the young Brit has shown himself to be in films like ’71, 300: Rise of an Empire, and Unbroken, he spends much of his performance here visibly struggling to hold his Brooklyn accent, with inconsistent results. 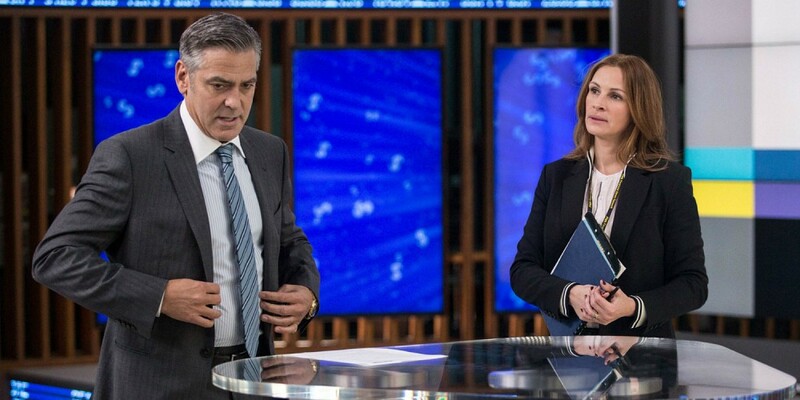 Money Monster falls apart in its third act, when the amount of disbelief requiring suspension becomes too great, but it skirt by on the goodwill and charm of Clooney and Roberts. Perhaps if it hadn’t tried to do so much, it would have had the momentum to survive its rather preposterous climax. As it is, Money Monster is outdone by all the more specialized movies that covered the same territory better.